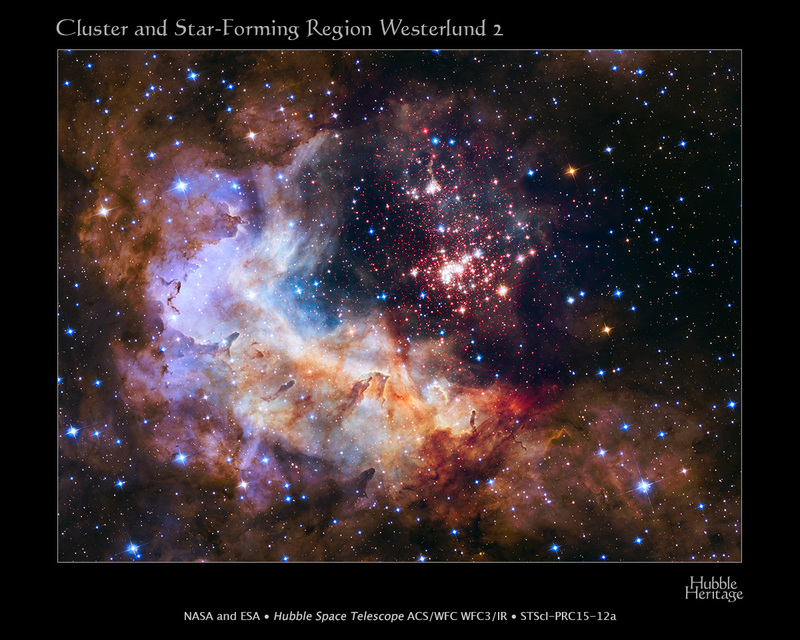 In celebration of the 25th anniversary of the launch of the Hubble Telescope, a beautiful image of the Westerlund 2 star cluster taken by the orbital observatory has been released: Hubble Space Telescope Celebrates 25 Years of Unveiling the Universe – HubbleSite. Westerlund 2 star cluster. 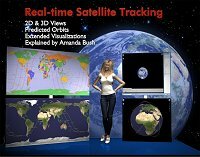 Zoomable version. A new window to the universe opened for humanity on the morning of April 24, 1990, when NASA’s Hubble Space Telescope was lofted into space, riding atop a Promethean flame from the space shuttle Discovery. Hubble’s scientific payoff has been immeasurable; it has shown us the universe as we never imagined. Above the hazy blur of Earth’s atmosphere, Hubble provides a larger-than-life, “super-rainbow” view of the universe: from ultraviolet, visible, and into near-infrared wavelengths of light. Hubble’s fantastic images unveil both beauty and cataclysmic disturbances across an unimaginably deep cosmic tapestry. Combined with the powers of NASA’s Great Observatories, Chandra, Spitzer, and the deorbited Compton Gamma-ray Observatory, Hubble painted a picture of the solar system and beyond that has changed astronomy forever. Initially tasked to measure the expansion rate of the universe, find very distant galaxies, and investigate black holes, Hubble’s research has now covered nearly every frontier in deep-space astronomy: the expansion and acceleration rate of the universe, the apparent link between galaxy mass and central black hole mass; early galaxy formation shortly after the Big Bang; strange transient events in space; and the chemistry and potential habitability of planets orbiting other stars. Hubble’s long exposures of the far universe have unveiled an “undiscovered country” of discordant objects, violent explosions, and tumultuous galaxy collisions. They tell the story of the dynamic evolution of the universe from the Big Bang. More than being just a tool for astronomers, Hubble is the people’s telescope. It is one of the most influential scientific instruments ever built, reinvigorating and reshaping what the world perceives as outer space. Its images and discoveries have captured the imagination of people around the world, touching everything from pop culture to science fiction, from academia to art. Hubble has also substantially improved science, technology, engineering and mathematics (STEM) education nationwide. Its education materials are used by half a million teachers and six million students annually in all 50 states. Thanks to five space shuttle servicing missions, totaling 32 astronaut space walks, and the multitude of scientists, engineers, and staff that worked on Hubble, the observatory has long out-lasted its planned end-of-mission in 2005. The observatory’s science capabilities are more powerful than at its launch, with upgraded instruments, computers, and control systems operating at top performance until at least the end of the decade. With support from ESA (European Space Agency), Hubble has served as a trailblazer for planning humanity’s next big step into the cosmos. The James Webb Space Telescope (JWST), a partnership with ESA and the Canadian Space Agency, is scheduled for launch in 2018 and will see farther back in time than Hubble with its extended infrared capabilities. JWST will reveal fledgling galaxies from the first 200 million years after the Big Bang. It will also peer deeply into the dusty planet-forming disks around young stars that Hubble often sees in silhouette, and push the boundaries of learning about planets orbiting other stars.